Russian World Forums • View topic - Are you a tourist ... or a Traveller? 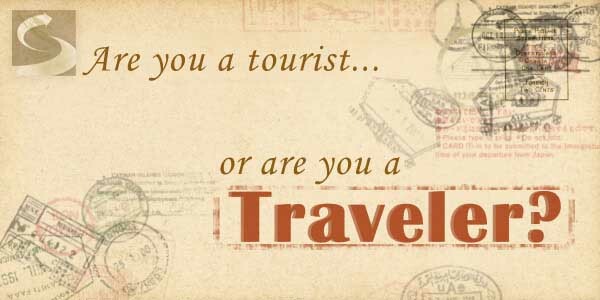 Are you a tourist ... or a Traveller? Post subject: Are you a tourist ... or a Traveller? The difference between travel and tourism is simple. A tourist experiences disconnected sights and sounds and enjoys them without drawing meaning. A traveler roams the earth, digests what he sees and hears, and collects them in a framework of understanding, which he both brings to his travels and deepens with travels. The former is a pleasant interlude in your life. The latter is about life itself. I think I am a mixture of the two, depending where I am travelling. So what is your attitude and behaviour when travelling? Post subject: Re: Are you a tourist ... or a Traveller? The comments are quite interesting, but is it so black and white? As I see it all of us start out as "tourists" as some of us travel we become more of a traveller, there are also of course those that will forever remain tourists. One of the key aspects of being a traveller at least as I see it is that the traveller learns to respect the countries and the people of the countries that they travel to, or in other words the traveller adapts to the surroundings while the tourist does not know how to adapt. I think I would consider myself more of a traveller than a tourist. When I traveled I was always more fascinated by what people where like in a new country and what their life was like and how they lived than I was in seeing Big Ben, the Kremlin or the Eifel Tower. Most of the time when I visited a country I would try and stay where the locals stayed and not in a tourist hotel and I really loved it when I stayed with locals in their house or apartment. I'll check the tourist box, make that speed tourist as I will race around seeing as many things as possible, but relax with the locals at night! Definitely a tourist. I'm not too interested in the history of places I have visited.